In its continuing effort to provide its diverse client roster with a range of marketing services, Gabriel deGrood Bendt (GdB) has hired Dan Hauser as its new public relations director. Most recently, Hauser served as senior communications consultant with Xcel Energy, the Minneapolis-based Fortune 500 utility. 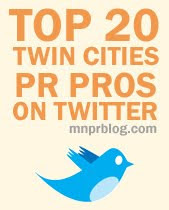 Prior to that, he created the public relations division for a suburban Minneapolis-based marketing agency and edited several international magazines.